The United Kingdom will double its non-lethal support to the Syrian opposition, said British Prime Minister David Cameron during a joint press conference with U.S. President Barack Obama at the White House on Monday. “There is no more urgent international task than this,” Cameron said. The European Union (EU) arms embargo has been amended, allowing the UK “to give technical assistance and technical advice,” he said. Cameron recently met with Russian President Vladimir Putin, who has agreed to help negotiate with Syria. U.S. Secretary of State John Kerry also met with Putin recently. The alliance between the three countries is a cautious one given Russia’s history, but Cameron and Obama expressed hopes for a fruitful meeting with Syrian leadership in Geneva this summer. Obama noted that “there remain lingering suspicions between Russia and other members of the G8.” He said it is in the interest of every nation, however, to ensure Syria does not become an outpost for radical groups. Cameron will play host at the G8 summit in Northern Ireland in June. 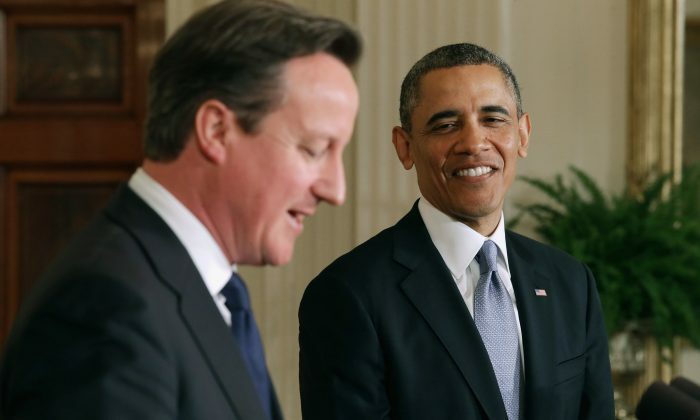 Cameron and Obama said transatlantic trade will be an important topic for both of them at the summit. Cameron said that currently the two countries engage in about $17 billion in trade. He said if a free trade deal is reached between the EU and the U.S., it could mean about $15 billion (10 billion pounds) for the UK. As they discussed free trade, the two leaders also said a top priority will be cracking down on tax evasion. They will implement a new mechanism to monitor where multinational companies make their money and pay their taxes. During the question and answer period following the press conference, reporters asked Cameron about his plans to secede from the EU, and they asked Obama how he felt about it.